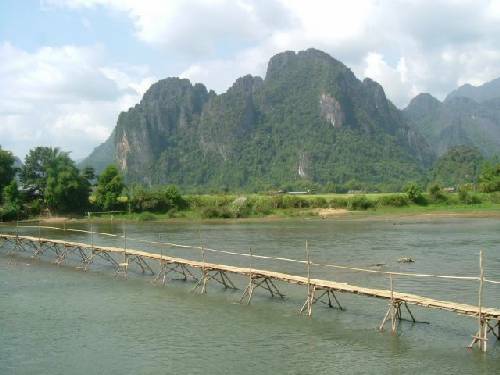 To say i am feeling rough and fragile after my days spent in Vang Vieng is an understatment. It seems the only way to "roll" here is to join in with the backpackers get reckless and drunk. After leaving cambodia we have made a few stop offs before arriving here as its simply to long a bus journey from Cambodia to skip the south (30 hours to be precise) We stopped of in Pakse which was nothing to rave about and spent one day there getting driven halfway to nowhere and back again then getting lost beracuse of some ******er tuk tuk driver and then we made our way upto Vientienne. There was nothing much to do here either and one day was more than enough to see a temple and do some wandering. Not saying its bad there but just not much to do or see, so we headed straight off the next day to Vang Vieng where the action is and what a contrast. Anyone who comes here would tell you how beautifull and serene it is here and how watching the sunset from the top of the hill near our hostel and watching it fall between the mountains and behind the river is one of the best things to see. But because of the main attraction - The tubing it is a place you would either love or hate. Its safe to say if you come here you need to expect to be partying on a table with a bucket shoved in your hand and nursing your hangover the next dy by going to one of the many bars that show friends on repeat all day and laying on there beds or hammocksIt would be easy to slip into this partying lifestyle if i still had the enthusias and energy of an 18 year old but i am getting on and feel it. Since we have been here it has seemed like we have done very little but we have had to extend our stay due to Robs injuiry whilst Tubing a few days ago which i will go on to explain. So tomorrow we are heading to some caves, lakes and waterfals (its dry season here so fingers crossed we see some water at all) And hope that poor Rob and his dodgy knees get better soon. So the crack with the Tubing is you rent a massive inner tire tube from the local market and they drive you 3km up river and leave you to drift down the river in your own time whilst getting pulled into the bars by the sides of the river with rope and offered free drinks, shots and cheap buckets. We stopped off at the first bar a little apprehensive having heard horror stories the night before from people with Friends in hospital after tubing and jumping off swings knocking teeth out or breaking limbs as the water is very dirty and in places very shallow, its impossible to know where the shallow spots are so everything holds a bit of a risk. We watched as people sommersaulted into the river and walked up trees at a great hight and jumped off swings and zip lines, all saying to each other that there was no way we could do that we are far to sensible and its far too dangerous. After several Beer laos a few buckets and free shots all three of us took it inturns to jump from swings into the water, play mud volleyball, tug of war and take the death slide. I dont know if it was the beer that gave us courage or watching everyone else do it injuiry free but we were enjoying being young and carefree and it was brilliant. At one point taking the massive slide into the water i got stuck half way down so had to walk to then end and throw myself off. I dont think i could have done this sober but doing it drunk was probably not wise either. Anyway this slide was the same side where rob landed on his knees in the water and has damaged ligament and is struggling to walk. As you wander the streets the next day you notice other peoples injuirys some alot worse than others. Think we came off lightly and i have been lucky with only a few bruises to the knees and a sore neck. The night life is pretty good here too and Me and Routh went out last night for a quiet drink which lead to finding a silver bucket in a bar which entitles the finder to free drinks, and cigs all night. We ended up making the most of this fantastic opportunity and having a blast (the cigs we gave away as i am a none smoker now its been over two months dont ya know) Feeling rough like everyone else always feels and looks here we have done little again and relaxed, eaten and read on our hammock outsde our room. I really like it here but not sure my liver can take a bashing here for much longer so i am looking forward to some trekking and culture again when we move on. I aso feel very old here amoungst 18 year old gap year students (if i was here at 18 i would be in trouble) And my hangovers seem to get worse with age. Luang Prabang next.